New paving coming to SE Woodward St.
Pete April 5, 2019 Comments Off on New paving coming to SE Woodward St.
You might have noticed the corner ramp construction underway at several intersections along SE Woodward St. in South Tabor. 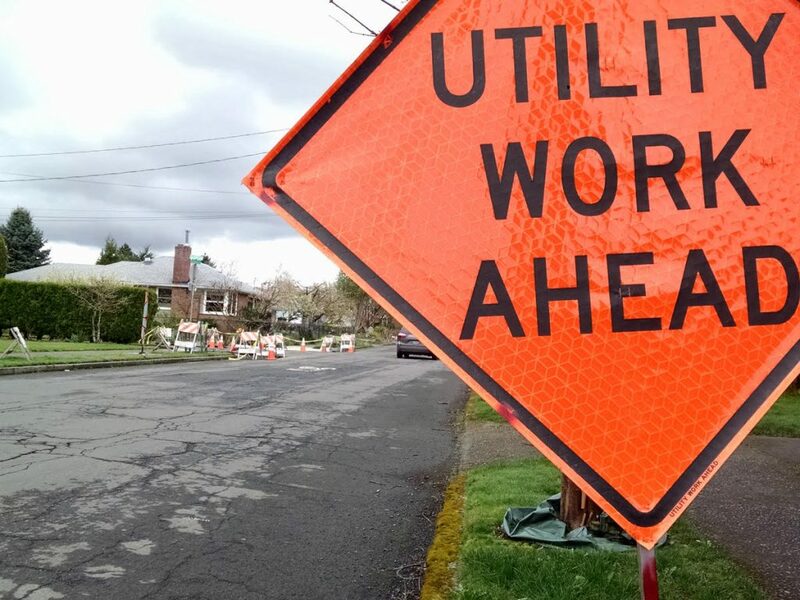 This is actually the first step in a larger resurfacing project planned for the summer of 2019 that will smooth out Woodward from SE 52nd Ave. to SE 74th Ave. 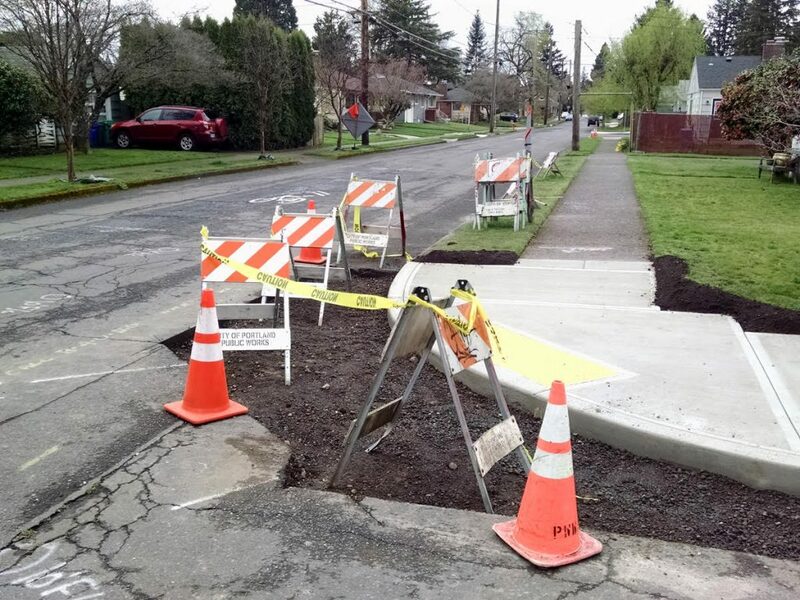 According to Scott Cohen, capital project manager at the Portland Bureau of Transportation (PBOT), the corners are being upgraded in advance to comply with the current standards of the Americans with Disabilities Act (ADA). He also noted that the City replaces only those corner ramps that are connected to existing sidewalks. Paving new sidewalks is not part of this project. Once the road resurfacing is complete, a second project will then bring speed bumps to Woodward between 52nd and 62nd. Cohen said this is part of a larger effort to bring Portland’s neighborhood greenways up to standard. 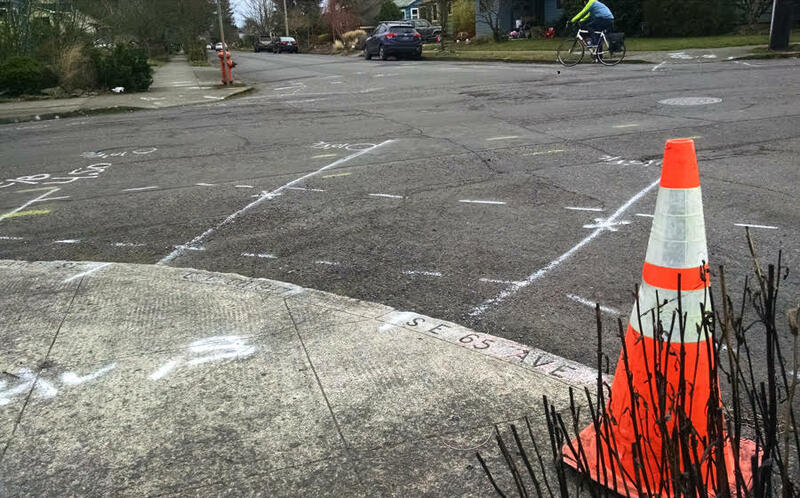 According to David Galat, PBOT ADA coordinator (and fellow South Tabor neighbor), construction crews are tasked with making sure that there is a way for pedestrians to safely navigate around worksites, without having to traverse in the street. For instance, if the worksite is on the south side of the street, the sidewalk on the north should not also be blocked. If you notice any safety issues during the ADA corner work, please contact David at David.Galat@portlandoregon.gov or 503-823-5703. You can also report safety issues through the PDX Reporter online app. While the new speed bumps are a start, more needs to be done to make Woodward safer for all users, specifically between 60th and 62nd. STNA’s land use committee successfully pushed to get this problem area on the Safe Routes to School priority list, but that full sidewalk and crosswalk construction project is currently unfunded and could remain that way for years. We asked PBOT to send a traffic engineer to see about lowering the posted speed limit through the bottleneck from 20 mph to 15 mph. Not sure they’ll do this, but we are hopeful something good will come from having them out to observe. We are gathering signatures to get yard signs we can post along Woodward alerting drivers to slow down and calling attention to the problem area. We are talking with PBOT about other creative ways to ensure that bikes and pedestrians have safe passage and priority through this constricted area. We will post back as there is progress. If you’re interested in following or supporting these efforts, come to our next land use committee meeting (see calendar in sidebar for details).